Prices range from 800 Euros to 1100 Euros and include Pearl White and Satin Gold color options. Toshiba has yet again expanded its portfolio of multimedia notebooks. The latest additions are the 15.6-inch Satellite L50-C, L50D-C, and 17.3-inch L70-C notebooks with processor options up to a Core i7 or AMD quad-core Carrizo A10-8700P with Nvidia GeForce 930M or Radeon R6 M340DX graphics, respectively. Color options include Satin Gold and Pearl White. Windows 10 Home will come pre-installed, so users will no longer need to manually upgrade from Windows 8. All configurations can be equipped with either HD (720p) or FHD (1080p) glossy displays. 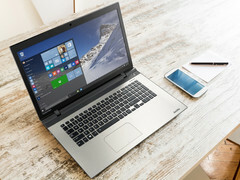 Toshiba recently announced its Satellite Pro A50-C and R50-C business notebooks in addition to a slew of updated models at IFA 2015. The Portege Z20t currently sits in our list of top 10 convertibles.